Rockstar Games‘Red Dead Redemption 2’ is set in the old West. Like many gamers who have plunged headfirst into the impressively immersive world of “Red Dead Redemption 2,” I have been scarred for life by the death of my horse. 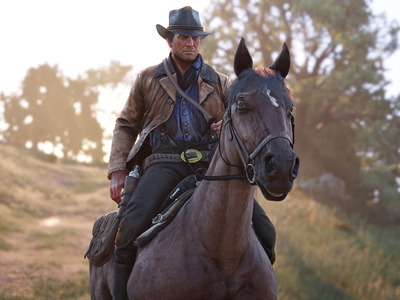 In “Red Dead Redemption 2” you play as Arthur Morgan, an outlaw roaming through the American wilderness in 1899. Needless to say, your horse is pretty essential to tooling around looking for trains to rob. I named my first horse Minty, and since the game rewards bonding with your horse by giving it improved health and stamina, I spent time dutifully brushing him, patting him, and feeding him sugar lumps. Then the unthinkable happened. While beating a speedy retreat from the law, I rode Minty headlong into a tree. Then into another tree. Then off a small cliff. As Minty lay dying, the game informed me I could not revive him, and I had to put him out of his misery. The experience was traumatic, but I was comforted to find out that I’m not the only one to lose my horse in unfortunate circumstances. The cinematic camera is deadly for horses. “Red Dead Redemption” has a feature which switches the camera angle to look like an epic, sweeping movie. The only problem: It makes steering a little tricky. Especially when trains come out of nowhere. This is the result of a glitch rather than irresponsible riding, but it seems at least some horses have survived the ordeal. And for those whose horses died in more conventional circumstances, social media is littered with tributes to fallen stallions.